Just Outdoor Blinds stand by three key principles; We will not be beaten on Quality, We will not be beaten on workmanship and We will not be beaten on service. Just Outdoor Blinds are local families first choice. 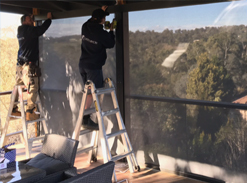 Just Outdoor Blinds is a family business servicing Melbourne. 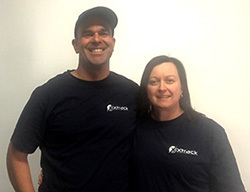 Owned and operated by Rob and Tracy Connellan, Providing premium quality Awnings & Blinds to residents and businesses. Just Outdoor Blinds offer a wealth of experience, honest advice and an expert opinion. We have an extensive range of Awnings and blinds to suit any application. Specialising in Outdoor Blind systems Just Outdoor Blinds can help you with your project. Choose Just Outdoor Blinds Ziptrak Blinds. 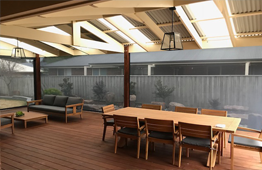 We have been helping families all over Victoria enclose their outdoor spaces with our Premium Ziptrak Alfresco Blinds. Using a premium track guided system the Ziptrak Alfresco Blind from Just Outdoor Blinds makes relaxing easy. The Ziptrak Alfresco Blinds will fully enclose your outdoor area. Providing additional living space for you and your family. *Conditions apply.